This book is really an early chapter book which could also be used as a classroom read aloud or bedtime story. All the stories center around Mrs. Trimble, her assistant Rose and her twin nephews, John and Jack. Mrs. Trimble owns a tea shop where she serves tea and delicious home baked cakes. While working one day in her shop, suddenly a giant cloud of smoke arose and a giant tea-pot appeared in the center of the shop. A wizard wearing a pointed cap adorned with stars popped out. Walter the Wizard needs her help because the king’s cook is ill, and he is in need of someone to bake cakes for his party. They all climb into his tea-pot and are whisked away to the kingdom where Mrs. Trimble saves the day by baking the cakes. Walter is so grateful that he gives her a magic tea-pot as a gift that will take her anywhere in the world she wants to visit. The magic words are magic teapot backwards—“Top eat Cigam!” So begins the magical adventures of our characters. In the first book of adventures, they decide to visit a spooky house and some ghosts where they meet Arthur Halloween, they take a trip to the moon and visit four purple men who are in need of polishing dust to keep the moon shiny and then visit another moon to gather supplies, convince a greedy dragon that he is eating too much and needs to go on a diet, and visit a land of dwarfs where Jack and John receive some surprise birthday presents. Mrs. Trimble even manages to confront an ogre and rescue the key to the city for the mayor. Perhaps my favorite adventure involves her ingenious solution to save the day when Santa Claus is unable to deliver presents on Christmas Day because his reindeer are sick. 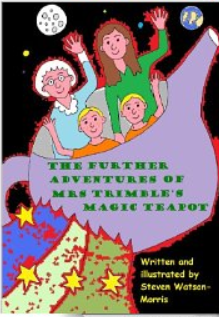 The Further Adventures of Mrs. Trimble’s Magic Teapot! So delighted that the author is giving us a sequel. 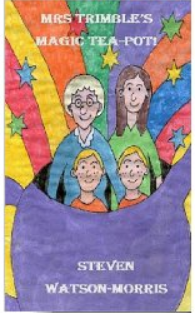 In Book Two the reader is treated to seven more magical adventures. This time the reader will meet a one-eyed giant, a silver snake, a naughty goblin, the Easter bunny, an alien planet, some bubbles, and a castle of dreams. The children will learn through Mrs. Trimble that we should be kind and understanding toward others even when others are angry with us, but she also teaches us that when we are naughty like the goblin, we need to undo the harm we have done to others, apologize, and make restitution for our mistakes. When Mrs. Trimble meets the Dream Maker, she learns how to drink hot chocolate as well as tea and sees how sweets can be turned into healthy fruits. What child would not like to have a bubble adventure! Mrs. Trimble and the twins are astonished when the Easter bunny oversleeps one year; they must rescue him and save the day! In their last adventure the stalwart group get to land on the Teapot planet where everything is shaped like a teapot, and where they are introduced to Earlgrey who will restore the magic to their teapot. To return his kindness, Mrs. Trimble will leave them with a special gift of her own. As in the first book, there are delightful pencil drawings. At the end of the book, readers will find a special bonus, coloring pages that feature all the characters in the book’s stories. I love, love, love the sound of this. It reminds me of The Magic Faraway Tree etc. Don’t know that one….I have to check it out!